3.10.2018 : Debate on the future of Europe with Mr Jüri RATAS, Prime Minister of Estonia. - Solemn Session : Speech by Mr. Milo Đukanović, President of Montenegro. 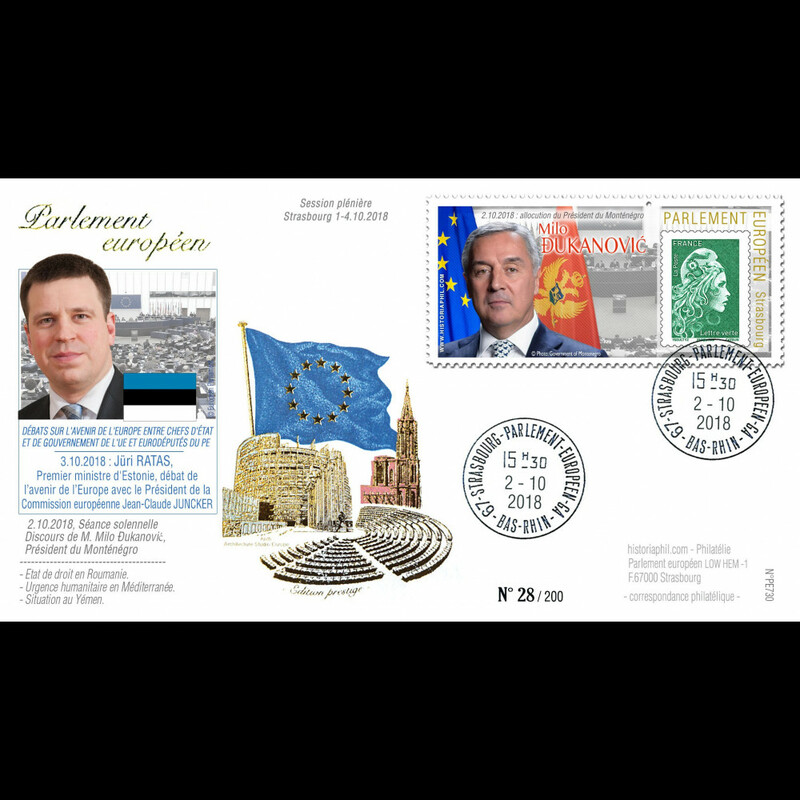 Franked 1 value Green Letter 20g "Marianne 2018"
on private stamp display unit "European Parliament, Strasbourg / 2.10.2018 : Speech by President of Montenegro, Milo Đukanović"
CE46-II : April 1995 - FDC Council of Europe " Speech by Mr. Lennart MERI, President of Estonia "
PE599A : 2011 - ESTONIA FDC 1st Day of Stamp "Introduction of Estonia in the Euro Zone"
BR117 : 03.12 - FDC Brussels "EU : Serbia, Kosovo, Turkey, Montenegro - Mr. Filat, Moldova"
PE693 : 02-2016 - FDC European Parliament "Visit Mr. Toomas Hendrik ILVES, Estonia"
CE67-III : 06-16 FDC Council of Europe "Speech by MM. Tsipras (Greece) & Rõivas (Estonia)"